Plasmonic nanostructures provide unprecedented capability to confine electromagnetic energy to nanoscale volumes to enhance light matter interaction. 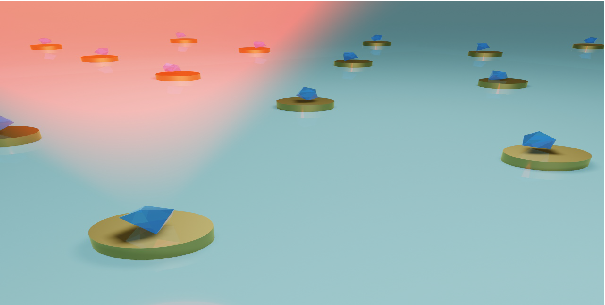 We leverage the plasmonic hotspots, which provides sub-wavelength trapping potential wells to stably confine nanoscale objects that have been delivered to the hotspots. We explore the realization of novel lab-on-chip devices for versatile application in transport, trapping and sensing of nano-scale objects. We have introduced novel nanotweezer designs including electrothermoplasmonic tweezers which enable fast and accurate positioning of target nanometric objects. Ndukaife, Justus C., Vladimir M. Shalaev, and Alexandra Boltasseva. “Plasmonics—turning loss into gain.” Science 351.6271 (2016): 334-335. Ndukaife, Justus C., et al. “Long-range and rapid transport of individual nano-objects by a hybrid electrothermoplasmonic nanotweezer.” Nature Nanotechnology 11.1 (2016): 53. Ndukaife, Justus C., et al. “Photothermal heating enabled by plasmonic nanostructures for electrokinetic manipulation and sorting of particles.” ACS Nano 8.9 (2014): 9035-9043. Nanophotonic technologies call urgently for scalable, large scale, and low-cost production of subwavelength optical elements. We explore large scale patterning and directed assembly of nanoscale optical components. To accomplish this, we explore the interplay between near-field optical forces and electric-field induced forces such as electrohydrodynamic flow, dipolar, Coulomb interaction, AC electro-osmosis, and heat-induced forces namely thermophoresis for directed self-assembly and patterning of nanoscale and sub-micron optical materials. Numerical simulations are employed to elucidate the mechanisms for nanoparticle assembly. Ndukaife, Justus C., et al. “Massive Parallel Positioning of Nanodiamonds on Nanophotonic Structures.” CLEO: QELS_Fundamental Science. Optical Society of America, 2017. Micro and nanoscale robots as an important class of active matter can take energy from their surrounding environment to self-propel. We investigate the synthesis, phototactic control of such synthetic machines for applications in novel lab-on-a-chip devices.